Gunnm (銃夢, Ganmu, literally "gun dream"), also known as Battle Angel Alita in its English translated versions, is a Japanese cyberpunk manga series created by Yukito Kishiro and originally published in Shueisha's Business Jump magazine from 1990 to 1995. The first two of the comic's nine volumes were adapted into a two-part anime original video animation in 1993 titled Battle Angel for North American release by ADV Films and the UK and Australian release by Manga Entertainment. Manga Entertainment also dubbed Battle Angel Alita into English. A live-action film adaptation titled Alita: Battle Angel was released on February 14, 2019 (February 6, 2019 in the UK). "Battle Angel" redirects here. For the 1993 original video animation, see Battle Angel (OVA). For the 2019 live-action film, see Alita: Battle Angel. The series is set in the post-apocalyptic future and focuses on Alita, a female cyborg who has lost all memories and is found in a junkyard by a cybernetics doctor who rebuilds and takes care of her. She discovers that there is one thing she remembers, the legendary cyborg martial art Panzer Kunst, which leads to her becoming a Hunter Warrior or bounty hunter. The story traces Alita's attempts to rediscover her past and the characters whose lives she impacts on her journey. The manga series is continued in Battle Angel Alita: Last Order and Battle Angel Alita: Mars Chronicle. Battle Angel Alita tells the story of Alita ("Gally" in the original Japanese version), an amnesiac female cyborg. Her intact head and chest, in suspended animation, are found by cybermedic expert Daisuke Ido in the local garbage dump. Ido manages to revive her, and finding she has lost her memory, names her Alita after his recently deceased cat. The rebuilt Alita soon discovers that she instinctively remembers the legendary martial art Panzer Kunst, although she does not recall anything else. Alita uses her Panzer Kunst to first become a bounty hunter killing cyborg criminals in the Scrapyard, and then as a star player in the brutal gladiator sport of Motorball. While in combat, Alita awakens memories of her earlier life on Mars. She becomes involved with the floating city of Tiphares as one of their agents, and is sent to hunt down criminals. Foremost is the mad genius Desty Nova, who clashes with Alita before becoming her ally. Tiphares exploits the Scrapyard and surrounding farms, paying bounty hunters (called Hunter-Warriors) to hunt criminals and arranging violent sports to keep the population entertained. Massive tubes connect the Scrapyard to Tiphares, and the city uses robots for carrying out errands and providing security on the ground. Occasionally, Tiphareans (such as Daisuke Ido and Desty Nova) are exiled and sent to the ground. Aside from the robots and exiles, there is little contact between the two cities. The story takes place in the former United States. According to a map, printed in the eighth volume, Scrapyard/Tiphares is near Kansas City, Missouri, and the Necropolis is Colorado Springs, Colorado. Radio KAOS is at Dallas, Texas. Figure's coastal hometown is Alhambra, California. Desty Nova's Granite Inn is built out of a military base — NORAD at Cheyenne Mountain Complex, Colorado. Battle Angel Alita is eventually revealed to take place in the 26th century. The sequel Battle Angel Alita: Last Order introduces a calendar era called "Era Sputnik" which has an epoch of AD 1957. The original Battle Angel Alita series begins in es. 577 (AD 2533) and ends in es. 590 (AD 2546), Battle Angel Alita: Last Order is mostly set roughly in 591 (AD 2547), and Battle Angel Alita: Mars Chronicle currently alternates between 373-374 (AD 2329-2330) and 594 (AD 2550). Battle Angel Alita features a diverse cast of characters, many of whom shift in and out of focus as the story progresses. Some are never to be seen again following the conclusion of a story arc, while others make recurring appearances. The one character who remains a constant throughout is Alita, the protagonist and title character, a young cyborg with amnesia struggling to uncover her forgotten past through the only thing she remembers from it: by fighting. 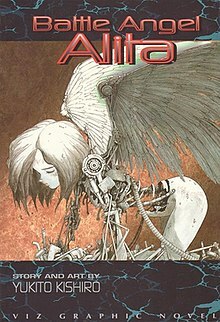 Early on in the story, Daisuke Ido, a bounty-hunting cybernetic doctor who finds and revives Alita plays a major role as well, but midway through the manga he becomes marginalized as focus begins to increasingly shift to Desty Nova, an eccentric nanotechnology scientist who has fled from Tiphares. Nova is the mastermind behind many of the enemies and trials that Alita faces, but does not make an actual appearance until more than two years into the story, although he is alluded to early on. Finally, Kaos, Desty Nova's son, a frail and troubled radio DJ with psychometric powers, also begins to play a crucial role after he comes in contact with Alita. He broadcasts his popular radio show from the wastelands outside the Scrapyard, staying away from the increasing conflict between Tiphares and the rebel army Barjack. Alita was originally a female cyborg police officer named Gally in an unpublished comic called Reimeika. Publishers at Shueisha liked her and asked Kishiro to make a new story with her as the main character. After he had come up with the plot for a storyline he was commissioned to make it a long-running series. Besides renaming Gally to Alita, the North American version of the manga also changed the city of Salem to Tiphares, after Tiferet. Since Kishiro also used the name Jeru for the facility atop Salem, Jeru was renamed Ketheres in the translation, after Keter. To further develop the Biblical theme in the original series, Salem's main computer was named Melchizedek, "the king of Salem" and "priest to the Most High God". The manga was first published in Shueisha's Business Jump magazine. It was then serialized from 1990 to 1995 in nine tankōbon. In the U.S., Viz originally released the story in a 25-page comic book, after which it followed the same volume format as its Japanese counterpart. Along with the rest of the series, Kishiro's original Battle Angel Alita manga is licensed for North American publication through Kodansha USA. Battle Angel Alita was licensed for international release in a number of languages and regions. It was published in Spain by Planeta DeAgostini, in Brazil by Editora JBC, in France and Netherlands by Glenat, in Poland by JPF, in Germany by Carlsen, in Taiwan by Tong Li Publishing and in Argentina by Editorial Ivrea. Another series titled Battle Angel Alita: Holy Night & Other Stories (銃夢外伝, Ganmu Gaiden) was published in Ultra Jump from January 24, 1997 to December 19, 2006. It was released in a single volume on December 19, 2007. It is composed of four short side stories: Holy Night, Sonic Finger, Hometown and Barjack Rhapsody. The series has been licensed by Kodansha USA, who published it digitally on October 30, 2018 and as hardcover on November 20, 2018. A 6-volume special edition titled Gunnm: Complete Edition was released in Japan on December 23, 1998. The series was released in B5 format and contains the original story, but with a different ending accommodating for the continuation of the story in Battle Angel Alita: Last Order. Also included are rough sketches, a timeline and the first three Battle Angel Alita: Holy Night & Other Stories short stories. A novel was released on April 4, 1997, by JUMP j-BOOKS, as part of the Japanese publisher Shueisha. A two-episode OVA was released in 1993, incorporating elements from the first two volumes of the manga with changes to the characters and storyline. According to Kishiro, only two episodes were originally planned. At the time, he was too busy with the manga "to review the plan coolly," nor was he serious about an anime adaptation. It remains the only anime adaptation of Battle Angel Alita to date and there are no plans to revive it. A 3-minute 3D-CGI rendered movie clip is included in volume 6 of the Japanese Gunnm: Complete Edition (1998). It showcases Alita in a Third League Motorball race with players from two of her races such as "Armor" Togo, Degchalev, and Valdicci, and depicts events from both of those races. Director James Cameron has rights to the film adaptation of Battle Angel. It was originally brought to Cameron's attention by filmmaker Guillermo del Toro. Cameron is said to be a big fan of the manga, and he was waiting until CGI technology was sufficiently advanced to make a live-action 3D film with effects comparable to Avatar. Alita was originally scheduled to be his next production after the TV series Dark Angel, which was influenced by Battle Angel Alita. After Avatar, he stated he would work on Avatar sequels before starting Alita. Cameron's producer Jon Landau said, "I am sure you will get to see Battle Angel. It is one of my favourite stories, a great story about a young woman's journey to self-discovery. It is a film that asks the question: What does it mean to be human? Are you human if you have a heart, a brain or a soul? I look forward to giving the audience the film." It will likely not hit screens before 2017. Landau half-jokingly stated that the project may be titled Alita: The Battle Angel, because of Cameron's tradition in naming his films with either an "A" or a "T". Cameron's film would be a live-action adaptation of the first four volumes of the manga series; "What I’m going to do is take the spine story and use elements from the first four books. So, the Motorball from books three and four, and parts of the story of one and two will all be in the movie." In October 2015, it was reported that Robert Rodriguez will direct the film with Cameron and Landau producing. On April 26, 2016, both The Hollywood Reporter and Variety reports that Maika Monroe, Rosa Salazar, Zendaya and Bella Thorne were in the running for the lead role. At near the end of May 2016, Salazar was cast as Alita. The film was scheduled for release on July 20, 2018. On February 7, 2017, The Hollywood Reporter reported that Jennifer Connelly would be joining the cast as one of the villains. On December 8, 2017, the first trailer for Battle Angel was released to the public. It was reported by JoBlo.com in February 2018, that the film was delayed to December 21, 2018. In late September 2018, it was announced that the film was delayed again, to February 14, 2019, in order to allow “more room to grow in the box office”, as well as avoiding competition with WB's Aquaman, Paramount's Bumblebee and Universal's Welcome to Marwen. In November 2018, Titan Books published Alita: Battle Angel - Iron City, a prequel novel for the film. The novel was written by Pat Cadigan, a notable science fiction author. Gunnm: Martian Memory is an action RPG video game for the PlayStation by Banpresto. It is an adaptation of the manga, following Alita (Gally) from her discovery in the Tiphares dump heap by Daisuke Ido up through and beyond her career as a TUNED agent. The story includes additional elements that Kishiro had conceived when he ended the original manga in 1995, but was unable to implement at the time, which involved Alita going into outer space. He then expanded the story, which formed the basis for the manga Battle Angel Alita: Last Order. Ashen Victor, a story set six years before the beginning of Battle Angel Alita. It primarily tells the story of a Motorball player and it sets the evolution of the game into what it becomes in the Battle Angel Alita series. Battle Angel Alita: Last Order, a continuation published monthly in Ultra Jump, and then in Evening. Battle Angel Alita: Mars Chronicle, a continuation of Battle Angel Alita: Last Order published in Evening. ↑ "Announcing an All New Translation of the Iconic Battle Angel Alita Manga from Kodansha Comics and ComiXology Originals". Anime News Network. Retrieved May 29, 2018. ↑ "Battle Angel Alita". Kodansha Comics. Retrieved May 29, 2018. ↑ "The KUDOS! List – Culture References Within Battle Angel Alita". Nick15.com. Retrieved 2012-09-20. ↑ Genesis 14:18; Melchizedek was renamed "David" in the first North American release of Battle Angel Alita. Subsequent releases retain the original name. 1 2 "Kodansha Comics to Publish Battle Angel Alita, Full-Color Attack on Titan: No Regrets Manga". Anime News Network. April 21, 2017. Retrieved August 4, 2018. ↑ "Gunnm (Alita, ángel de combate)" (in Spanish). Planeta DeAgostini. Retrieved 13 August 2011. ↑ "Battle Angel Alita" (in Portuguese). JB Communication do Brasil. Archived from the original on 26 July 2011. Retrieved 13 August 2011. ↑ "Gunnm #01" (in French). Groupe Glénat. Archived from the original on 10 September 2010. Retrieved 13 August 2011. ↑ "Battle Angel Alita" (in Dutch). Groupe Glénat. Archived from the original on 14 August 2011. Retrieved 13 August 2011. ↑ Abigail (29 September 2006). "Battle Angel Alita". Tanuki.pl (in Polish). Małgorzata Kaczarowska. 496. Retrieved 13 August 2011. ↑ "Battle Angel Alita" (in German). CARLSEN Verlag. Retrieved 13 August 2011. ↑ 銃夢 (in Chinese). Tong Li Publishing. Retrieved 13 August 2011. ↑ "Battle Angel Alita" (in Spanish). Ivreality. Retrieved 18 August 2017. ↑ "Battle Angel Alita: Holy Night and Other Stories". Penguin Random House. Retrieved November 13, 2018. ↑ "MNS Exclusive Interview: Battle Angel (GUNNM) Creator Yukito Kishiro". Anime News Service. Archived from the original on 17 November 2007. Retrieved 2007-12-14. ↑ Lindsay Robertson. "James Cameron Planning 'Avatar' Trilogy". Yahoo!. Archived from the original on 2010-01-18. ↑ Carroll, Larry (February 18, 2010). "'Avatar' Producer Says 'Battle Angel Alita' Has A New Name, Will Follow 'Avatar 2'". MTV News. Retrieved May 3, 2016. ↑ Marshall, Rick (2009-12-14). "'Avatar' Director Offers Update on Battle Angel Alita Adaptation". MTV. Archived from the original on 2013-05-24. Retrieved 2013-03-11. ↑ "Live-Action "Alita: Battle Angel" Finally Shows Its Hand". Crunchyroll. December 8, 2017. ↑ "James Cameron Hasn't Forgotten About 'Battle Angel'". Screen Rant. August 20, 2010. 1 2 "Alita: Battle Angel after Avatar 2". ICv2. 2010-02-19. Retrieved 2012-09-20. ↑ "Cameron Reveals More On Avatar 4 - Movie News - Empire". empireonline.com. Retrieved 13 April 2015. ↑ "BATTLE ANGEL Update from James Cameron". Collider.com. Retrieved 2011-01-31. ↑ Kroll, Justin (October 14, 2015). "James Cameron Producing 'Alite: Battle Angel' with Robert Rodriguez Directing". Variety. ↑ Kit, Borys (April 26, 2016). "Zendaya Among Finalists for James Cameron's 'Battle Angel' Movie (Exclusive)". The Hollywood Reporter. ↑ Foutch, Haleigh (May 26, 2016). "Exclusive: Rosa Salazar to Lead 'Battle Angel Alita'". Collider. ↑ Chitwood, Adam (May 28, 2016). "Fox Dates 'Alita: Battle Angel'; Shifts 'The Predator' and Two Marvel Movies". Collider. Retrieved September 3, 2016. ↑ Kit, Borys; Porreca, Brian (February 7, 2017). "Zendaya Among Finalists for James Cameron's 'Battle Angel' Movie (Exclusive)". The Hollywood Reporter. Retrieved February 8, 2017. ↑ "Fox pushes back The Predator & Alita: Battle Angel release dates". Retrieved 2018-02-13. ↑ ""GUNNM Last Order" notice by Yukito Kishiro". Jajatom.moo.jp (English version of Yukito Kishiro's official website). Archived from the original on 2003-07-16. Retrieved 2007-08-15. ↑ "木城ゆきと『銃夢』サーガ最終章となる『銃夢火星戦記』、本日発売のイブニング22号より巻頭カラーで開幕！　さらに14年ぶりとなる新作読み切りも掲載！". evening.moae.jp (in Japanese). October 28, 2014. Retrieved May 12, 2015. ↑ "コミック誌の部数水準". Yahoo! Japan. Retrieved March 6, 2007. Wikimedia Commons has media related to Battle Angel Alita.